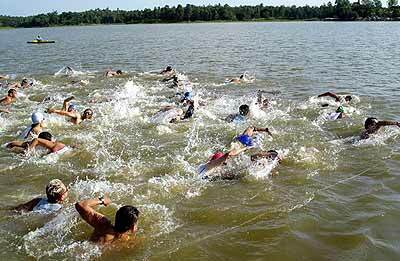 About 200 Thai and foreign athletes last week took part in the Triathlon and Duathlon 2004 international sport festival hosted by the Chiang Mai branch of the Sports Authority of Thailand. Tri-athletes head out into the 1.5 km swim. The Duathlon and Triathlon events took place on Sunday, September 26 from 7 a.m. - 12 noon. The triathlon consisted of a 1.5 km swim, a 35 km cycle and a 10 km marathon. It was open to males under 35 years old, with another age category for girls and boys not over 16 years old. Racing for home during the 35 km cycle portion of the event. The Duathlon consisted of a 35 km cycle and a 10 km marathon. This event was open to various age groups, including a “seniors” category, 35-45 years, as well as Under-14s and Under-18s. 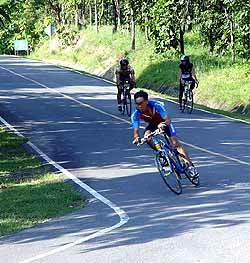 In the triathlon, competitors started by swimming in the Huay Tungtao reservoir, and then cycled along Klong Chollapratharn (irrigation canal) Road to the Hang Dong-Samoeng intersection, and returned along Klong Chollapratharn Road, passing the 700 Year Anniversary Sports Complex, to Huay Tungtao reservoir and then to the finishing line at the 700 Year Sports Complex. The Duathlon followed the same route - without the swimming leg. The first 500 to cross the line received mementos and certificates. Saturday October 2, saw the first of the Sawesdee (softball) cricket tournaments of the season. Coach Eric Little could have done without the downpour Friday night, which led to him repeating all the groundsmanship he had carried out Friday afternoon - but that’s cricket! The tournament was well supported with seven schools taking part. There were eight teams and the average age was 12. Chiang Mai Schools Cricket Alliance was delighted to see two teams that included girls, one team with five girl players. Sai Moon School in Hang Dong hosted the tournament, with P.R.C., Mae Pong , Rong Or, Sahagon 2, Pa Mai Dong and Chol Prathan Phataek Schools competing. The tournament got off to a good start at 9 a.m. There were eight overs to each game and eight players per side. Chol Prathan Phataek who was in the first group was very strong from the beginning, and Sahagon 2 was leading the second group. The tournament continued until approximately 3 p.m. when the children were presented their medals by Assistant Professor Dr. Charinratana Buddhapuan. The results were: Chol Prathan Phataek School, 281 points, Wat Rong Or, 244 points, Prince Royal College, 288 points, Moo Bahn Sahagon 2, 212 points. Chiang Mai Provincial Police Station held friendship football matches on September 29 at the Chiang Mai Municipality Stadium, to strengthen relationships with Chiang Mai media. The first match between the police and press kicked off at 3 p.m. Despite the valiant attempts of the media, the first half ended with the police leading the press by 2-0. Five minutes into the second half, the press were able to score, but that was the only goal, leaving the final score with the police in front 2-1. 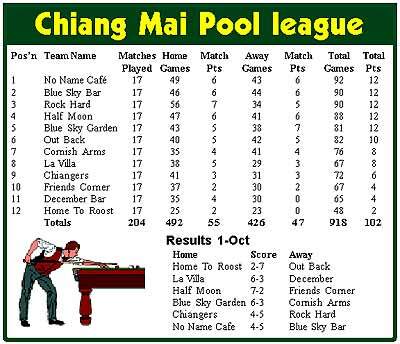 The second match was between police from Provincial Police Bureau Region 5 and Chiang Dao Police Station. Chiang Dao police team tried but a good goalkeeper stopped all their attempts at scoring, with the final score 2-0 to the Provincial Police. After the tremendous performance of the women’s weightlifting team at the Athens Olympics Games, the Thailand Amateur Weightlifting Association held the Thailand Weightlifting Championships from October 1-4 at the Chiang Mai University gymnasium. It is hoped that a new generation of weightlifters will be forthcoming to represent the nation in four years, and to also promote the sport. Athletes at the weightlifting competition held at CMU. This was a curtain-raiser to the Asian Weightlifting Competition that took place from October 5-15 at same venue. 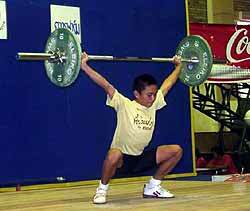 26 weightlifting clubs around Thailand entered the competition, with a total of 321 young weightlifters (193 men and 128 women) participating. Thailand’s four new heroine weightlifters Udomporn Polsak, Pavina Thongsuk, Aree Wiratthaworn and Wandee Kampiam watched the competition to cheer and inspire the young athletes as well as promote the sport. Gen Intarat Yodbangtoey, president of the Amateur Weightlifting Association of Thailand, presided over the opening ceremony on October 1. There will be good-natured cheers for the home players at the 700 Year Stadium, Center Court, on October 23 at 5 p.m. when the International Consulate Tennis Competition gets underway. Whether your loyalty lies with Chiang Mai or Japan, Germany or the U.S. - or a combination of many countries - you’ll have plenty of fun and opportunities to wave your own flag and cheer for your favorite player during this benefit tournament. Governor Suwat Tantipat of Chiang Mai, Consul General Katsuhiro Shinohara of Japan, Honorary Consul Hagen Dirksen of Germany and Tom LeDoux from the Consulate of the United States will compete. Former National Champion of Thailand, Worapol Tongkamchoo, and former member of the Thai Davis Cup Team, Suparat Chookuan, will also compete as will several Junior Chiang Mai Tennis Champions. Masters of Ceremonies will announce the action in Japanese, Thai, German and English languages. Spectators will have plenty of opportunities to talk to the players and get autographs - bring along a spare tennis ball. There will be lucky draws of tennis memorabilia and other surprises. All proceeds will be managed by “Tennis Is My Dream”, a charity that provides 20 hours of free beginning and intermediate tennis instruction for children from local homes and schools. Equipment, including shoes, is provided to all of the children who participate in these clinics along with professional tennis lessons. Tickets (100 baht p.p.) are available at Bake and Bite Bakery and Restaurants (both locations), or telephone Khun Gai at 01-882-9545, Ajahn Boonsong at 01-531-0177 or Ray Twine at 053-211-542.